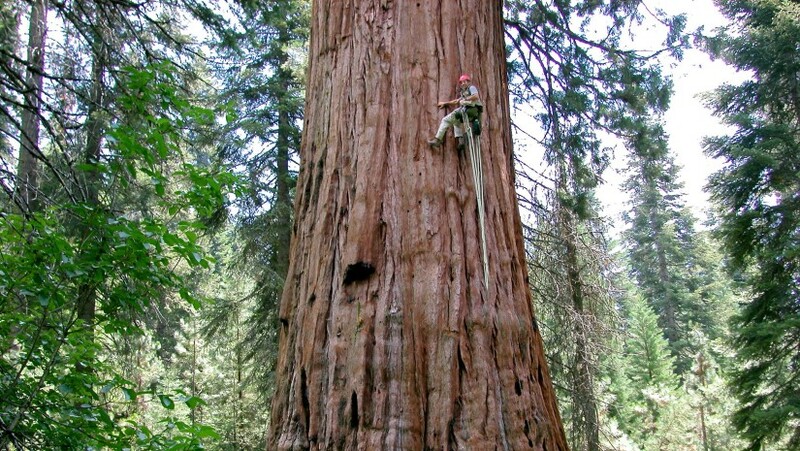 Researcher climbing a large redwood tree. Ecoss studies the interactions of plants with their physical and biotic environments at a fundamental level common to all organisms: gas exchange, energy balance, and water relations. We explore how plants make a living in diverse environments ranging from deserts to rainforests. 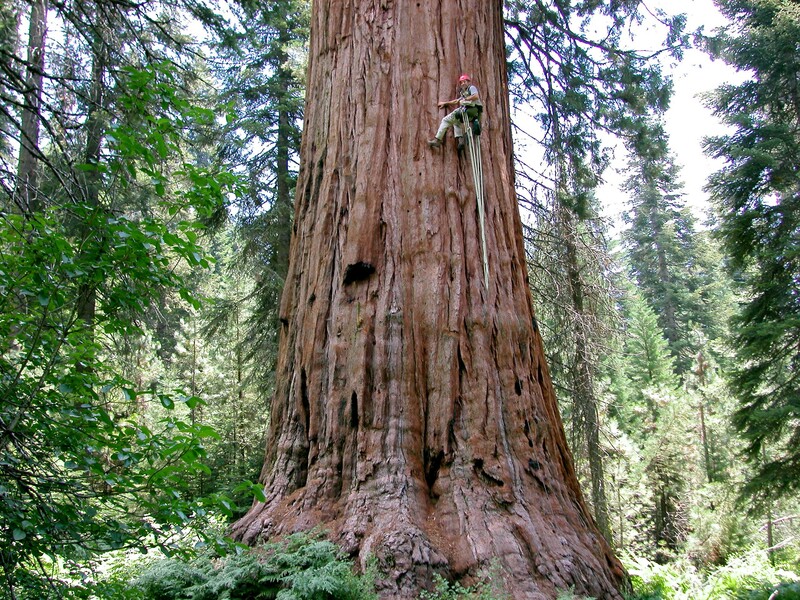 A longstanding interest is the biophysical and ecological determinants of height and size growth in the world’s giant trees, including the towering redwoods of California and massive eucalypts of Australia. Here we’ve learned that the inescapable influence of gravity increases water stress as trees grow taller. And we’ve dispelled the dogma of decadence in old trees by showing that largest and oldest trees are the most productive individuals in their stands. With an eye to a warmer, drier future we’re examining how soil and atmospheric drying conspire to stress the hydraulic system of plants. Here we’re using new technology that enables high temporal resolution measurements of xylem tension that may reveal the threshold conditions that lead to hydraulic dysfunction. Recently we’ve taken a fresh look at plant water relations by investigating the role of “metabolic water”, water generated during respiratory metabolism. We’ve developed a new technique for labeling metabolic water with “heavy” oxygen that lets us see where that water is produced. We suspect metabolic water contributes to tissue-level phenomena including xylem embolism repair, turgor maintenance, and seed germination. Stay tuned! Extremes have long fascinated biologists. Studying the fastest, the deepest, the smallest, the hottest, and the largest organisms offers insights to the constraints on life imposed by the laws of physics and chemistry. How tall can a tree grow? 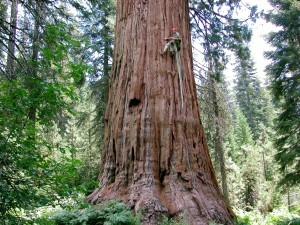 Does growth slow as trees age and grow taller and larger? How does gravity influence water stress as trees grow taller? Our research on California’s redwoods – the world’s tallest trees – and Australia’s giant eucalyptus, which may once have been even taller, has demonstrated that height growth is a dynamic interaction of a tree’s need to outcompete neighbors for light and the increasing influence of gravity on water within the tree as height increases. The tops of taller trees are more water stressed than those of shorter trees, even in wet soils. This water stress can cause irreversible damage to the water conducting system, and to avoid this, trees regulate water loss through the microscopic pores (stomata) on the leaf surface. This necessarily reduces photosynthesis and may explain the slowing of height growth as trees grow ever taller. Yet, although height growth slows as trees grow taller, we now know that the tallest and largest trees are actually growing extremely fast. In fact, we’ve convincingly dispelled the dogma of decadence – that large old trees are unproductive- by documenting that the biggest redwoods and eucalyptus are producing more new wood each year than any other tree in the stands where they occur. Sillett SC, Van Pelt R, Kramer RD, Carroll AL, Koch GW. (2015) Biomass and growth potential of Eucalyptus regnans up to 100m tall. Forest Ecology and Management 348:78-91. Ambrose AA, Sillett SC, Koch GW, Van Pelt R, Antoine ME, Dawson TE. (2010) Effects of height on treetop transpiration and stomatal conductance in coast redwood (Sequoia sempervirens). Tree Physiology, 30:1260-1272. There are no biological water pumps, at least none has been discovered. Yet plants raise water to heights over 100 meters. What’s the source of energy for this impressive lifting feat? In fact, the energy is the heat that drives evaporation from leaves into the drier outside air. This results in capillary forces in the liquid water at the microscale sites of evaporation inside leaves, and because of water’s strong cohesive property, these forces pull on the continuous column of water throughout the plant, drawing it up from the roots. What if we could construct a synthetic version of this as an “energy free” means of moving water? We’re working with engineers and materials scientists to do just this, and it’s not easy! Plants have a 350 million year head start, but of course evolution proceeds by trial and error, whereas we use a more directed approach to reverse engineer nature. We’re applying biophysical insights gleaned from nature to physical systems comprised of microcapillary tubing, porous ceramics, and a new nanomaterial, graphene oxide. Metabolic Water: Not Just for Rodents Anymore? All organisms that “breath” oxygen, be they microbes, plants, or animals, produce water as a byproduct of respiratory metabolism. This “metabolic water” is a vital source for some animals, notably desert rodents, some of which meet the majority of their water needs by metabolic production. We are now exploring the significance of metabolic water for soil microorganisms and plants, groups for which this water source has not been studied. We hypothesize that for soil bacteria, especially during dry periods, metabolic water production may prove to be essential for maintenance of water balance. And for plants, while the huge flux of water associated with transpiration would seem to make metabolic water production of trivial importance, we suspect that in certain life stage, plant tissues, and environmental conditions, this internal source of water may make a critical contribution to water balance. For our metabolic work with microbes and plants, we have developed new methodological approaches using stable isotopes that greatly increase our ability to detect and quantify the importance of metabolic water. Research outlined above is being conducted by George Koch and others.